Exploring the ideas of companies and entrepreneurs of peer-to-peer based businesses in the sharing economy. A once unheard of phenomenon, the sharing economy now sets the the standard for our on-demand world. 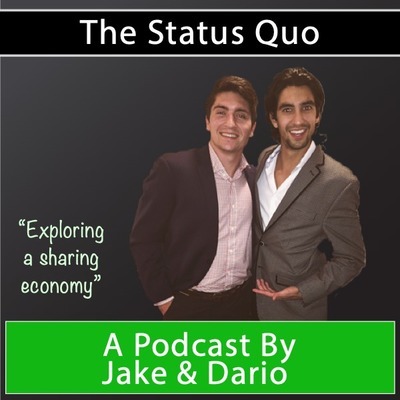 "The Status Quo" podcast aims to give listeners insight into how creatives are leveraging this economy and setting the new standard on how business is done. Co-Living is alive and well here in Charlotte and is lead by the creative and driven Jason Wallace. Jason takes us through how he got started with Charlotte Community Room Rental, how he has built a very strong business, and that his success goes much deeper than a good idea and is rooted in community. Co-Living can be defined as two or more unrelated people living together and is seeing a great resurgence due to the growing popularity of the sharing economy, increased cost of living, as well as changes in generational tastes and preferences. Enjoy our thoughts on co-living and learning more about Community Room Rental! This week's episode we check out an exciting time in the sharing economy as a HUGE player files to go Public. We explore some of the features of Lyft's filings, when they plan to go public, and our thoughts on how the markets will react to this new type of company on the NASDAQ. This is an exciting time for the sharing economy and will only get more interesting from here! In Episode Three of the Status Quo Podcast, we have our very first guest, Diane Peacock of Blue Lollipop Road. Her tales of traveling, getting oneself unstuck, forging your own path and creating a business along the way are extraordinary. Don't miss out on this great episode and conversation with Diane.